Are you studying for an Exam? Is there an area you have questions? 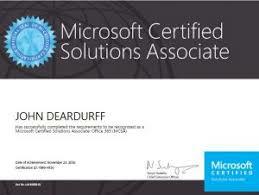 Join others just like yourself with the Microsoft Certification Study Groups Full Disclosure: I am a moderator for the Database and Exchange study groups. Also don’t forget, it you need to brush up on specific subjects you can always look at Microsoft Virtual Academy which is FREE training on many areas of study. Be the first to comment on "Microsoft Study Groups"